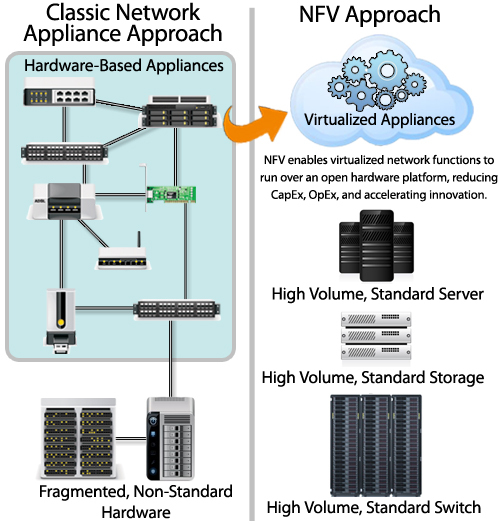 What is Network Function Virtualization (NFV)? The telecom industry sometimes has a way of making even the smartest of us feel lost, confused, and occasionally even a little dumb. Just when you’ve figured out the latest hot buttons in the industry buzz – cloud computing, OpenFlow and software defined networking (SDN) – along comes another new concept for you to get your head around. The latest new concept is called Network Functions Virtualization, or NFV, and it has rightfully taken its place in the industry conversation as another step towards creating more agile, lower cost network infrastructure. But what exactly is NFV, and how does it fit into the current industry drive towards enabling more open, consolidated, packet-based networks? Let’s start with the basics. So what exactly is Network Functions Virtualization? Network Function Virtualization, or NFV, is a way to reduce cost and accelerate service deployment for network operators by decoupling functions like a firewall or encryption from dedicated hardware and moving them to virtual servers. Instead of installing expensive proprietary hardware, service providers can purchase inexpensive switches, storage and servers to run virtual machines that perform network functions. This collapses multiple functions into a single physical server, reducing costs and minimizing truck rolls. If a customer wants to add a new network function, the service provider can simply spin up a new virtual machine to perform that function. For example, instead of deploying a new hardware appliance across the network to enable network encryption, encryption software can be deployed on a standardized server or switch already in the network. This virtualization of network functions reduces dependency on dedicated hardware appliances for network operators, and allows for improved scalability and customization across the entire network. Different from a virtualized network, NFV seeks to offload network functions only, rather than the entire network. What are the advantages of NFV? NFV reduces the need for dedicated hardware to deploy and manage networks by offloading network functions into software that can run on industry-standard hardware and can be managed from anywhere within the operator’s network. Is NFV an open standard? So the concept and benefits of NFV are simple enough, but implementing NFV gets more complicated. That’s because in order to realize the full benefit of NFV, some level of cooperation and interaction between various network solution providers and network operators is needed. That’s where industry groups like ETSI come into play. Over 130 of the world’s leading network operators have recently joined together to form an ESTI Industry Specification Group (ISG) for NFV. While the ETSI NFV ISG has garnered a lot of interest in defining the framework for NFV, it is only one player amongst many in this now burgeoning area of industry development. Literally dozens of groups, some open-source, others more traditional standards organizations are creating pieces of the (large) puzzle needed to make NFV a reality. All while operators large and small kick the tires, engage in proofs-of-concept exercises and evaluate the business case for what is surely the industry’s largest transformation in decades. Chalk Talk video: What is SDN? This post has been updated from its original content to reflect the latest definitions and resources related to NFV. The last update to this page was July 13, 2016.